Yesterday I watched parts of the Apple keynote about the new iPad. Apple has marketed the new iPad as a great way of both viewing videos and playing video games and the new device seems to be redefining mobile gaming as it has more memory and a higher screen resolution than the Xbox 360 or Playstation 3. By coincidence, yesterday I was also in a workshop with Bambi Betts who recommended the book Disrupting Class, which I've just downloaded and started reading. A review of this book refers to disruptive innovations that bring to the market a product or service that is different and competes against nothing. I started to think how this term can very easily be applied to the iPad - two years ago there was nothing like it, now we're talking about the post-PC world and saying that we cannot imagine a world without it. The iPad is a good example of a disruptive technology - something that forces us to change the way we behave. If the goal of disrupting class is to improve student-centric learning, then disruptive technologies can help us to tailor the delivery of educational materials to each student's learning style, as we move away from a one-size-fits-all approach with all learners in the same place, being taught at the same time in the same way. Video games are another disruptive technology. Can they also help to reform education? We know that these games can allow students to engage in systems thinking, we know they promote different cognitive skills, we know that students learn by doing/playing and we know that the multi-player online games promote collaboration. For example one of the most popular games, World of Warcraft, has 12 million subscribers who together form its collective intelligence - they work together to solve problems that could not be solved individually. It seems this is something teachers would want be be promoting. Yesterday I also listened to the TEDtalk by the game designer Jane McGonigal. She goes one step further and says it's her goal to use gaming to solve real-world problems - that it can be as easy to save the world in real life as it is to save the world in online games. Her goal is that people should spend more time playing online games that help us think about world problems such as hunger, poverty, climate change, obesity and so on. These games promote deep focus and concentration to tackle difficult problems and her argument is that millions of people could benefit from practice in solving these problems. She talks about how we are better in games than we are in real life - we achieve more and we are motivated and inspired to do things that matter, to collaborate and cooperate - we stick with problems and get up after failure and try again. In real life, however, we often feel overwhelmed, anxious and depressed if we fail. Can games give us more confidence, can they give us a more positive outlook so that we regard failure as simply a lesson learned? She then shared a staggering statistic - The World of Warcraft wiki is the 2nd largest wiki in the world after Wikipedia and the total amount of time spent playing World of Warcraft by the 12 million subscribers adds up to 5.93 million years! She said the average amount of time a young person in a developed country spends playing games before the age of 21 is 10,000 hours. That's an interesting figure because it almost exactly matches the amount of time a young person spends in full-time education. 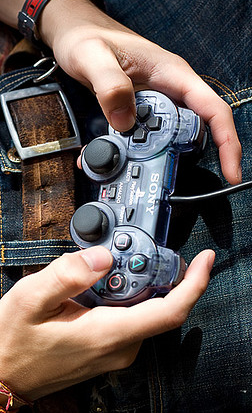 Young people are spending as much time in the virtual worlds of gaming as they do in school. Another interesting fact is that this 10,000 hours is the same amount of time that Malcolm Gladwell in the book Outliers says you need to devote to practicing something to become an expert. Taking this to its conclusion, we now have about 500 million people who are already "master gamers" and in the next decade we will see 1 billion more. Will these people be better equipped to solve the world's problems? Gamers are super empowered, hopeful individuals who believe they are capable of changing virtual worlds and that they could be capable of changing the real world. While they are now using games to get away from the real world, it doesn't have to end there. We need to encourage these master gamers to spend more time in the real world. They have great problem solving skills as they need these to generate new knowledge to solve the games - they have learned that there is a value to being a learner in order to solve problems and are generally good at project based learning that involves critical thinking and problem solving. Gamers are also highly engaged and expend a great cognitive effort to solve problems (even if this is not necessarily enjoyable). They formulate hypotheses and test them out. They are used to being unsuccessful and going back and starting again. Games keep you in the middle of the cycle - they are not too hard so as to make people quit, but not too easy as to be boring. In fact games tap into what Vygotsky referred to as the "zone of proximal development" where the challenge is just right and the best learning occurs. In a game you are at a certain level and you don't move on until you have mastered various skills - isn't that what we as teachers also think of as effective learning? In schools games could definitely be disruptive technologies. It takes up to 50 hours to play and complete a game so it would be difficult to find the time to do this in schools, particularly as progress is not something we test or measure and therefore it's often not seen as valuable. Many games are collaborative and the current model of education also doesn't often reward collaboration - in some cases it's regarded as cheating. However games are also individual - they are actually a great example of individualized instruction that could be used to radically change the way we learn - to keep students individually challenged the students must work at their own pace. Are we as teachers prepared for this? Or are we more comfortable with everyone in the class being on the same page? Recently I attended a wonderful workshop by Tim Rylands where he showed the amazing writing students had done using the games Myst, Riven, Exile, Revelation and Uru. He has used these games to inspire students talking because he says "writing floats on a sea of speaking and listening". Some of these games are now free to download onto the iPad or iPhone - so I have done this and I'm hoping to be able to try these out with a class later in the year to see what impact this can have on writing. In the past few weeks I've thought a lot more about how games can be used to support learning than ever before. Have you used games in school? How has this impacted student learning? Please share, I'd love to know more! I recently attended ASB Unplugged conference in Mumbai. Unfortunately I missed Tim Ryland's sessions; I heard some great feedback. But a common thread that came up in many different sessions and keynotes was gamification. Students at ASB were using Civilization V as a tool to learn more about history and geography; to great effect. They were speaking passionately while explaining in depth how it related to an increased understanding. Obviously some teachers will have a very difficult time finding the time or comfort levels to introduce such an intensive game (or others similar) but we can't deny the power of gaming and the connections it provides students and gamers of all ages. Exciting times we live in. Cheers from Manila. Hi Brandon - I'm moving to the new campus of ASB next school year and I can't tell you how excited I am at the idea of being able to explore some of these cutting edge technologies that can truly transform education. I love the way teachers there are stepping out of their comfort zones, I love the "can do" attitude that pervades the school. I know I am so lucky to be going to work there and that I too am at the start of a whole new phase in my own learning! I'm sure that'll be fantastic and a wonderful chance to learn and grow. We have a staff member that came from ASB to ISM and has had positive things to say about working there. Cheers. Wow, those numbers are pretty amazing. It is exciting to know that there is a generation coming through that can be described in the terms that you used: optimistic, productive, social, learners. I also got a copy of Myst III, and am really excited to try to watch it with my class. It does not really "fit into" the curriculum as such, so I need to make it fit in somehow. Let me know how it goes when you get it up and running, and I'll do the same.